A vitamin B complex supplement typically contains riboflavin, pantothenic acid, folic acid, niacin, biotin, thiamin, vitamin B6 and vitamin B12. Most people get enough B vitamins through their diet. However, people with restricted or poor diets or those with certain medical conditions may benefit from taking a vitamin B complex supplement. Always talk to your doctor to determine if supplementation is appropriate in your situation. While personal vitamin needs vary from person to person, you shouldn't get more than 100 percent of the RDA from your vitamin B complex. All of the B vitamins are water soluble, which means excess amounts are excreted through your urine and not stored in the body. Because of this, some people mistakenly believe that taking too much will not cause any adverse effects. While it's true that it's riskier to take high amounts of a fat-soluble vitamin, such as vitamin A or vitamin E, water-soluble vitamins may also cause adverse effects when taken in excess. To avoid consuming too much of any vitamin, it's wise to be aware of the recommended dietary allowance (RDA) of nutrients for your age and gender. The RDAs, established by the Institute of Medicine, are based on gender and age and should only be used as a guideline. Certain medical conditions or lifestyles may influence the recommended amount of vitamins you should take. Generally speaking, most healthy adult men and women should consume approximately 2.4 micrograms of vitamin B12, 1.3 milligrams of vitamin B6, 400 micrograms of folate, 5 milligrams of pantothenic acid and 30 micrograms of biotin. Men need 16 milligrams of niacin, 1.2 milligrams of thiamin and 1.3 milligrams of riboflavin, while women should have 14 milligrams of niacin, 1.1 milligrams of thiamin and 1.1 milligrams of riboflavin. Pregnant and nursing women should check with their doctors since they require more of each nutrient. 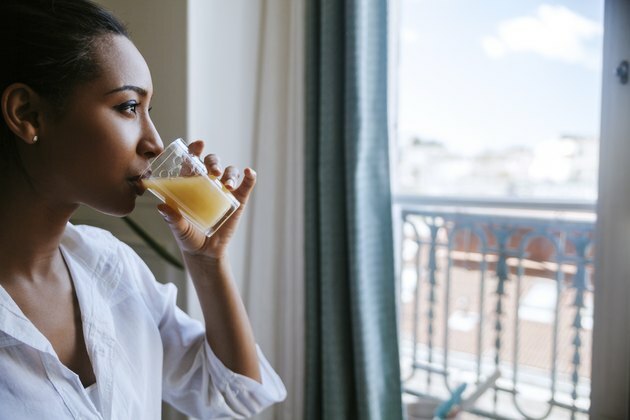 The tolerable upper intake level is the maximum amount of a vitamin or mineral you can take without running the risk of experiencing unpleasant side effects. Although it may be beneficial to take more than the recommended dietary allowance of certain vitamins, you should never take more than the tolerable upper intake level unless specifically instructed by a doctor to do so. Some B vitamins, such as vitamin B12, thiamin, biotin, pantothenic acid and riboflavin, don't have tolerable upper intake levels. This means that you're unlikely to experience adverse reactions when taking these vitamins, even if you take high doses. However, folate, vitamin B6 and niacin do have a tolerable upper intake levels. Getting more than 1,000 micrograms a day of folate, 35 milligrams a day of niacin or 100 milligrams a day of vitamin B6 may cause unpleasant side effects. Avoid taking a vitamin B complex supplement that contains more than these amounts. The most common side effects of taking too much of a vitamin B complex include diarrhea and abdominal cramps. More serious side effects include tingling or redness of the skin and nerve damage. The folic acid in the supplement may also mask a vitamin B12 deficiency or may trigger a seizure in patients taking anticonvulsant medications when taken in excess. High doses of these supplements may also negatively interact with certain medications. If you think that you've consumed too much vitamin B complex and are having any unusual symptoms, call your doctor for advice. WEIL: Can Any B Vitamins Be Harmful? Are Centrum Vitamins During Pregnancy Harmful?